BHP-Billeton's AC6000W loco putting its 6,000hp to work. If you haven't already made a folder where all your downloads are stored, it's the first important task. Using Windows Explorer, create a folder called Downloads or Working or MSTSDloads or a name you prefer. To do this, start Explorer, highlight the C: folder name, choose File/New folder from Explorer's menu bar and enter the name for your downloads folder. Having a folder dedicated to storing your downloads simplifies jobs such as virus scanning and unpacking zipped files. Under your downloads folder, create a sub-folder - call it unziptemp or something similar. Use this folder as temporary storage for files you extract. Also, use unziptemp to run any installation program (after a virus scan) or activity package that you extract from a zipped file. This makes it easier to delete the EXE or activity APK file after installation (but keep the original zip if you can afford the disk space). a third for activities (e.g., C:\MSTSDloads\Activities\. With these sub-folders, you can keep your downloads more manageable. Another sub-folder to create is one in which to store backup files (call it, for example, MSTSBackups), such as ENG files, a zipped loco folder or even a zipped route folder. MSTS seems to be able to find files even when you don't want it to so it's best to keep this backup folder away from the ...\Train Simulator\ folder. This application is the most common one for unpacking compressed files (those files with a zip extension to their name, or more technically, files of type zip). WinZip can be downloaded from www.winzip.com or it's found on nearly every computer magazine's monthly cover CD. If you haven't used WinZip before, familiarise yourself with how it works - it's quite simple and the help section provides tutorials. Note that webTrainSim uses WinZip in Classic mode and all instructions refer to using WinZip in this mode. One point to note is its ability to extract files to a specific folder path if the package was put together by the author in that way. If that folder needs to be created, WinZip will do that as part of the extract process. Sometimes you may find it easier to drag-and-drop files from WinZip into a folder in Explorer. For example, some authors request you to create a new sub-folder for their loco or rolling stock. So do that in Explorer. Move to this new folder. Then in WinZip's file list, choose the files for copying to this new folder. Just drag these files (hold down the left mouse button) from WinZip to the Explorer folder window (you'll need to have Explorer open in a maximised window). An important note about naming folders for locos and rolling stock: don't use spaces in a folder name. Even though we're used to Windows' files with spaces, MSTS can sometimes get upset with a folder name such as SF 1234. If you want to space out the "SF" and "1234", use a folder name such as SF_1234, with the underscore character providing the separation for easier reading. After you've installed Train Simulator, use Windows Explorer to see where all the folders and files are under the Program Files folder. The Trains subfolder is the most relevant and you'll see sub-folders in here that are named the same as the locos and rolling stock that you see in Train Simulator itself. Another sub-folder under Trains is the Consists folder - it contains all the files that define a trainset's consist (locos, passenger coaches, freight wagons). Now it's time to have a break and see what Train-Sim.com has to offer - click here for a new window to open. You may as well register now (it's free) then browse the File Library. Choose the latest files section first, then come back and browse the separate sections. Take a few minutes, too, to visit the MS Train Simulator message board - lots of advice is posted here. You've probably never used WordPad very much but it's going to be a handy tool when a Train Sim file has to be edited. You can't use NotePad or Word for Train Sim files. If, for example, you look at the Dash9 folder in Windows Explorer, you'll see a file with extension ENG - that's the engine file that defines how a Dash 9 loco works in Train Sim. All locos have an ENG file and each item of rolling stock has a WAG (wagon) file. Each loco's ENG file describes to Train Simulator its horsepower, braking system, rolling resistance, maximum speed, and so on. Click here to look through a sample ENGine file (a new window opens). All files, except ACE graphics files, can be loaded into WordPad - the most common ones we may have to work on are ENG and CVF (cab view file), sometimes SMS (sounds) and CON consist files. Just note that these files are in unicode-text format and WordPad can read and save this type; NotePad can't, but you may have your own favourite text editor that has this feature. The GG1 is a classic electric locomotive of US rail. Here's an engineer's view from the cab. This site has the most resources, and more importantly, each file available for download has a short description. You can view the author's "readme" file (by choosing View) to see any special instructions and extras. Click here to login and go to the File Library (a new window will open). After logging in, you'll be taken to the File Library. Choose Newest Files first to get an idea of what's available. Come back then to the View by Section choice and browse through some sections, such as Diesel Locomotives or World Locomotives. Note that files are listed by date, from current to earlier (as far back to about June 2001). If you're unable to log in because the site is too busy, use the link at the bottom of the login page to Browse Newest Files. You'll see that there's a search facility. This comes in handy when you've written down the name of an interesting file and later come back to do the download, or you want to check any special instructions in the author's "readme" file, or you want to obtain a list of all files dealing with, say, SD40 locos (enter sd40*.zip). You may see the term aliasing mentioned in some descriptions. We'll talk more about it later. It's a clever method of saving disk space by re-using cabviews and sounds for similar locos once you've got the original author's files. The GG1 was used for both passenger and freight. Here Conrail 4800 heads a heavy freight on the NEC outside Washington. Your first download will be Carlos Gomes' excellent, free utility titled ConBuilder. ConBuilder is usually available at Train-Sim.com or you can get it from Carlos' site at www.geocities.com/conbuilder/. Although MSTS comes with a set of tools, and a consist builder is part of these tools, unless your monitor supports a resolution better than 800x600, you won't be able to build sets of locos, passenger cars or freight wagons to run trains that you download. The latest version of Conbuilder is V1.4.9 (as at 15-Mar-02). 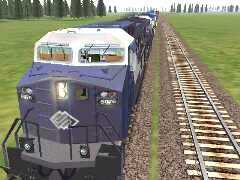 This version is available at Train-Sim.com File Library, and it includes a help file. Not only does ConBuilder enable you to create consists from the locos, passenger cars and freight wagons you have, but it also tests Activities for any rolling stock you may not have but is required by a particular activity. See a later page for more about testing activities. This enables ConBuilder to send off reports for tests you do. Under Tools, there's a more extensive write-up of what tasks ConBuilder can help you with. At Train-Sim.com, you'll need to download a small fix for the Activity Unpacker utility program. Search for tsunpacker or for the file tsunpack.zip (4kb, 21-Aug-01). After this update is applied to "tsunpacker.exe", you only need to use the "Run..." command from the Windows start menu to unpack an activity.